Accounts for less than 1% of all congenital heart defects. In mothers who take lithium throughout early pregnancy, the incidence is increased 20-fold; 1 in 1000 live births. The distal, non-atrialized, portion of the right ventricle (RV), named the RV proper, is significantly smaller than the proximal portion of the RV. With the dilated and atrialized RV and an incompetent tricuspid valve, the functional impairment of the right heart results from tricuspid regurgitation and decreased forward flow from the right heart. Up to 20% of patients with Ebstein’s anomaly have one or more accessory pathways. 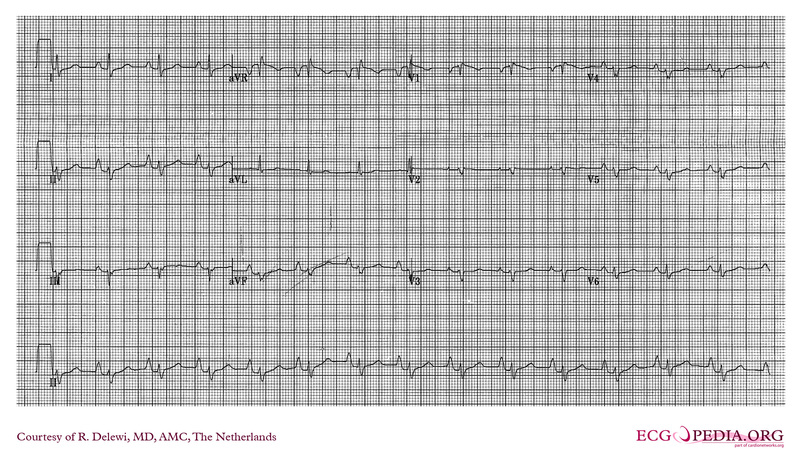 WPW syndrome is an arrhythmic syndrome of intermittent tachycardia resulting from an accessory pathway that bypasses the AV node, directly connecting the atria and ventricle. Various other abnormalities, including ventricular septal defect (VSD), patent ductus arteriosus (PDA), coarctation of the aorta, pulmonary outflow tract obstruction, and more have also been found to be associated with Ebstein’s anamoly. This is due to the different severities of tricuspid and right heart anomalies patients may have. Neonates most often present with cyanosis. Such early presentation is more frequently associated with another cardiac lesion, such as an ASD, allowing for right-to-left shunting. Cyanosis typically improves as pulmonary resistance decreases after birth. Severe tricuspid regurgitation leads to elevated right atrial pressure, backing up the venous circulation upstream. On auscultation, a systolic murmur, best heard at the left lower sternal border, from tricuspid regurgitation is commonly found. Echocardiogram is the most useful diagnostic tool for Ebstein’s anomaly. In patients with severe disease, marked cardiomegaly with decreased pulmonary vasculature markings may be seen. Patients are treated depending on their presentation – asymptomatic patients may need no treatment, but should continue to be closely monitored. Nitric oxide may also help improve pulmonary blood. Endocarditis prophylaxis is recommended for cyanotic patients with Ebstein’s anomaly. Infants with heart failure may be treated with digoxin and diuretics. Patients with a history of paradoxical emboli (via an ASD or PFO) or atrial fibrillation, anticoagulation is recommended. Surgical tricuspid valve repair or replacement is recommended for patients with progressive symptoms, right heart failure, cardiomegaly, severe cyanosis, or paradoxical embolism. "Ebstein's Anomaly for Adults | Cleveland Clinic." Ebstein's Anomaly for Adults | Cleveland Clinic. Cleveland Clinic, n.d. Web. "Ebstein's Anomaly of the Tricuspid Valve." Ebstein's Anomaly of the Tricuspid Valve. UptoDate, n.d. Web. Left heart lesions in patients with Ebstein anomaly. AU Attenhofer Jost CH, Connolly HM, O'Leary PW, Warnes CA, Tajik AJ, Seward JBSO Mayo Clin Proc. 2005;80(3):361.